Come with us to the Kasbah! So many stairs–glad we wore good shoes! 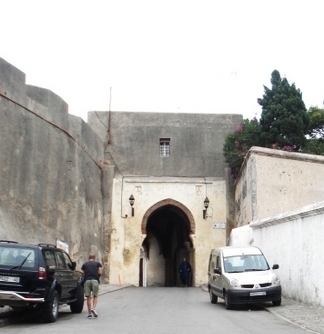 On Monday, we drove to Tarifa and took the high-speed ferry over to Tangiers, Morocco. 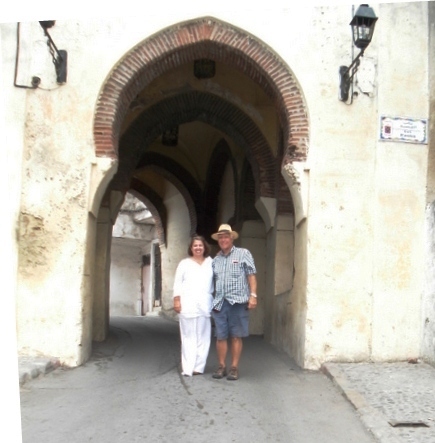 We had a fabulous time and really enjoyed seeing the old town, the Kasbah. Walking the Medina with a guide who grew up there and seemed to know every person, doorway, and little interesting street. The Souk (marketplace) was truly amazing–butchers, an incredible fish market, bakeries, etc. Every neighborhood needs five things–the hamam (baths), a public fountain for water, a bakery, a school, and a mosque. We’ve included photos of each of these from just one small neighborhood in the Medina. I think the photos speak for themselves. Enjoy the slide show. Click on the first small thumbnail photo and then toggle through using the arrows. Oh–one other funny note–we met the manager of the Continental Hotel–one of the fancy hotels right near the harbor. He is a childhood friend of our guide’s. He is born and raised in Tangiers, but has a home in Elachove—in the Basque country just next door to my family in Ibarrengelu. He took one look at me and said, “you’re not American–where are you grandparent’s from?” And then he proceded to speak to me in Basque! Agur! This entry was posted in Uncategorized on September 18, 2013 by ayoelkers. I bet you guys are ticked off at Bernanke. Dollar got creamed and Euro shot up to 1.35. Good thing the wine is so cheap. Sounds like you are having a ball.